In 1823, carnival ended in tears when a terrible tragedy claimed the lives of 110 boys, Fiona Vella says. Although carnival is generally associated with fun, exuberance and colour, it was tragedy and sadness which marked this festivity on February 11, 1823, after more than 100 children died in Valletta. Details of this terrible tragedy are immortalised in black and white in the Malta Government Gazette of Friday, February 14, 1823 which is archived at the National Library of Malta in Valletta. Initially, news of this tragedy was recorded as a Government Notice in the Malta Government Gazette (No. 557) by Richard Plasket, Chief Secretary to Government, wherein he declared that an investigation was taking place in order to obtain any possible evidence regarding this fatal accident. A published report of these findings was later annexed as a supplement (pp. 3391-2) to the same journal of February 14, 1823. In this long report, Plasket includes information that was provided to him by the Archbishop of Malta, persons examined before the Magistrate of Police including both relatives of the victims and other individuals who were present during this incident, and also a medical report related to this case. 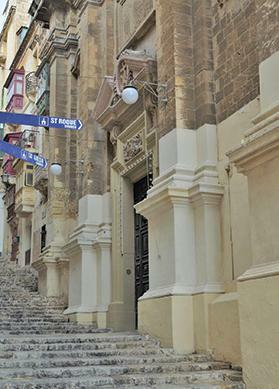 At the beginning of this statement, Plasket furnishes a context for this mishap wherein he mentions that in those years, during the last days of the carnival celebrations, it had become a tradition to gather a group of boys aged from eight to 15, who came from the lower classes of Valletta and Cottonera, to participate in a particular activity. During this activity, children took part in a procession to Floriana or elsewhere. Then, after attending Mass, they received some bread which was financed by the government and other beneficiaries. The main aim of this activity was to protect the children by keeping them out of the riot and confusion of the carnival that took place in the streets of these cities. The arrangement of this procession was under the responsibility of the ecclesiastical directors who taught catechism. Indeed, according to this tradition, on February 10, 1823, some children attended Mass in Floriana and were then accompanied to the Convent of the Minori Osservanti in Valletta, which today is known as the Convent of the Franciscans of St Mary of Jesus or Ta’ Ġieżu. Here, they were given bread. The same procedure was intended to take place the day after. Everything started according to plan on February 11, 1823. The children were gathered in a group and were taken to Mass in Floriana. However, when the ceremony lasted an hour longer than usual, the children’s procession to the convent in Valletta coincided with the end of the carnival celebrations, when a great number of jubilant people were returning home. This led to the next blunder, as a number of adults and children who were passing by and who knew of this tradition, secretly mixed in with the other boys in order to share the bread which would be distributed. In line with the usual arrangement, these boys were to enter one of the convent’s corridors from the church vestry door – then, they would be let out through the opposite door of the convent in St Ursula Street, where the bread would be distributed. In order to prevent the boys who received their share from re-entering to take a second helping of bread, it became customary to lock the door of the vestry. Yet this time, since the children were late, this door was left open for a longer time so that they could enter. As the sun was setting and darkness crept in, nobody realised that other men and boys who did not form part of the original group were entering too. Soon, the boys who were queuing in the corridor found themselves being pushed by these trespassers as they forced themselves in. The situation worsened when eventually the vestry door was closed and the children were shoved further at the end of the corridor where a door stood half open so that no one could get back in a second time. Further mishaps led to the tragedy. A lamp which was usually lit in the corridor was somehow put out, leaving the overcrowded area in total darkness. This confused the people even more and as they tried to push forward in order to get out, the boys who were at the front fell down a flight of eight steps on top of each other, thereby further blocking the door, which opened inwards. Suddenly, both those who were distributing the bread and the convent’s neighbours began hearing terrible screams. They ran to give their assistance but a lot of time was wasted as they tried to open the two doors which led to the corridor in order to reach the people inside. Eventually, many children were taken out and revived. However, 110 boys were already dead from suffocation when they were squashed in such a small place or because they were trampled upon. After investigating this accident, the Lieutenant Governor concluded that this was an unfortunate accident caused by a succession of errors. Consequently, no one was accused for the death of these children since these acts were not done on purpose to harm them. In fact, Plasket commented that everyone had collaborated to assist these poor boys and even the victims’ relatives had allowed the police and soldiers to work speedily and diligently in order to save as many children as possible. He insisted that were it not for this, the tragedy could have been much worse. As I followed further this narrative by focusing on the names mentioned in Plasket’s report, I managed to trace the name of the captain of the Malta Fencibles who led the soldiers during this tragic moment. It was his descendant, Marquis Nicholas De Piro who led me to see Colonel Marquis Giuseppe De Piro’s portrait which is located at Casa Rocca Piccola in Valletta. An interesting discussion ensued during which Marquis De Piro spoke about General Sir George Whitmore, who headed the Royal Engineers’ detachment on Malta as its Colonel Commandant between 1811 and 1829. Whitmore had written about his experiences in Malta and had also produced some illustrations. Interestingly, Marquis De Piro is in possession of a copy of one of these ancient illustrations in the form of a very small slide, which shows some individuals being trampled upon by a group of other people. He wonders whether this slide portrays this unfortunate accident of the carnival of 1823. Yet no children are included in this representation and so it is not clear whether it actually depicts this narrative. My research ends at Ta’ Ġieżu Church and I watch in silence the place where these children lost their lives. Sadness engulfs me when I climb up the steps on my way back as I think how a piece of bread could lead to death.